Google Image Search has a new option that lets you restrict the results based on their color. For now, the option is not available in the user interface, but you can tweak the search results URL to try it. Great. This one is been an experimental search for Picasa 3, too. Thanks I didn't know about it. Thank you. I tried the same example in Italian, but the search is more efficient in English. Not quite. The options that were available in that experimental sidebar are not new and can be accessed from the advanced search page. You can restrict the results to black&white images, grayscale and full color images, but you can't pick a more specific color. @Alex: you're right, not so much color choice as in the option you're talking about. tell us again how this works? where EXACTLY would one be able to specify an exact color? In this example, "red bird" actually gives better results. Yes in some ways better, but not always the same. but with the colour filter, can find blue cars, where nobody even thought to mention the car is blue. So its not so much for finding the really good matches, but for finding the 'long tail', the large number of images not well described, and so almost unfindable by conventional keyword searching. The option to add several color input is amazing, I was able to find a specific image I was searching for reducing the chromatic gap! AM going to blog this. You're missing the point, since the feature you've mentioned has been available at Google since the launch of the image search engine. The new feature lets you refine the results by picking a predominant color. As a proof, here's the advanced search page from 2001 (hosted by the Internet Archive). 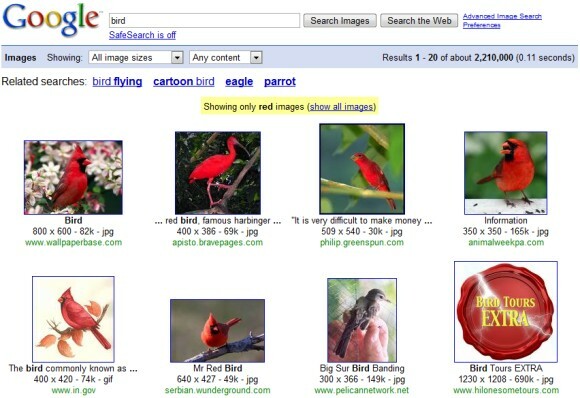 At that time, you could choose the number of image results displayed on a page. This will be fantastic.Now we will get proper image rather than mixed ones.undoubtedly good invention. How does Google image search get these images? I've written a greasemonkey script which allows you to select the color from the search page itself..
Just add "&imgcolor=red" or whatever color you're looking for to a conventional image search and you will get the new color search. The drop-down and text field above isn't working for me either, by the way. By using this tool we convert Binary code to ASCII text . You may quickly need to know how the computer internally intreprets a text that you could read or you may need to know what could be the textual representation of 0's and 1's that the computers uses. Either way, this tool can help you quickly find the conversion.